1. Briefly explain why you would like to be a participant in this course during summer 2013. First, after almost completing my first semester using D2L for my hybrid course, I would like to experience the student view of the class, more than just using the “student view” under the role switch icon. I would like to see what it is like to take a course on D2L. I would like to spend time reviewing my own course content and design with my colleagues for a best practices experience, developing a concise navigation and further developing a strong learning community. my KSU 4401: Senior Seminar. I would like to design and develop ways of using the “Group” resource on D2L. Additionally, I would like to explore innovative ways to use the “Widget” on D2L. I have been using the “Widget” but I would like to set up a “Learning Widget” where the learners could provide resources and ideas for the class. This would make the “Group” and “Widget” a way to enhance the learning community. 2. Briefly explain what your plans are for enhancement with the course(s) listed above. First, I want to develop a strong D2L learning community in my course. Right now the discussions are working for student interactions, but I would like to explore the “Group” options for creative ideas for setting up groups to explore the design and development of the student portfolios, career search process, citizenship issues, graduating in digital world and most importantly, topics suggested by the learners. I would like to have a learning space that provides the students with place to reflect, process, and share ideas and resources, in addition to the course discussions and face-to-face time in class. 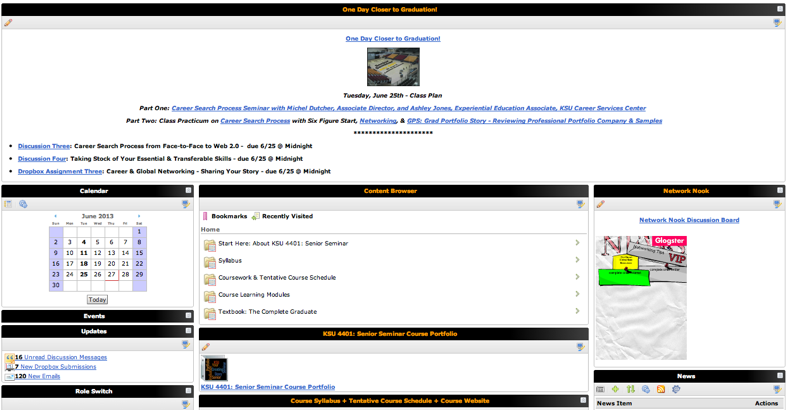 Secondly, I have been using Widgets to announce upcoming class information and to showcase resources. I would like to explore creative ways my colleagues of using Widgets to enhance their classes. I envision a “Best Practices of Widgetology” (my term!). Most importantly, I would like to set up a “Learner Widget” that the students can use to post, share ideas and resources, related to the course and new “Groups”. I would be posting for them, but it would be their “Learning Widget” space. I would speculate that might give the learner more ownership of the learning community. Thirdly, I would like to see if any colleagues in the course enhancement seminar would volunteer to be added to my class so that they could give me feedback to the course design. 3. Briefly address outcomes you would like to see with this hybrid course. 1. Critiqued and updated the navigation of my hybrid course. 2. Learn how to use “Groups” to enhance the learning community. 3. Designed and developed topics for the “Groups” and add them to the course, however, knowing that I will customized the “Groups” based on the needs of the learners. 4. Learn new and innovative ways to utilize the “Widgets”, inviting the learners to post and share resources and ideas, connected to the newly formed “Groups” and the course.